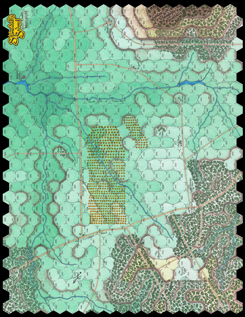 Washington’s Crossing is an operational simulation of the American winter campaign of December 25th, 1776 to January 6th, 1777 that resulted in the twin victories of Trenton and Princeton and turned the fortunes of the American Revolution. 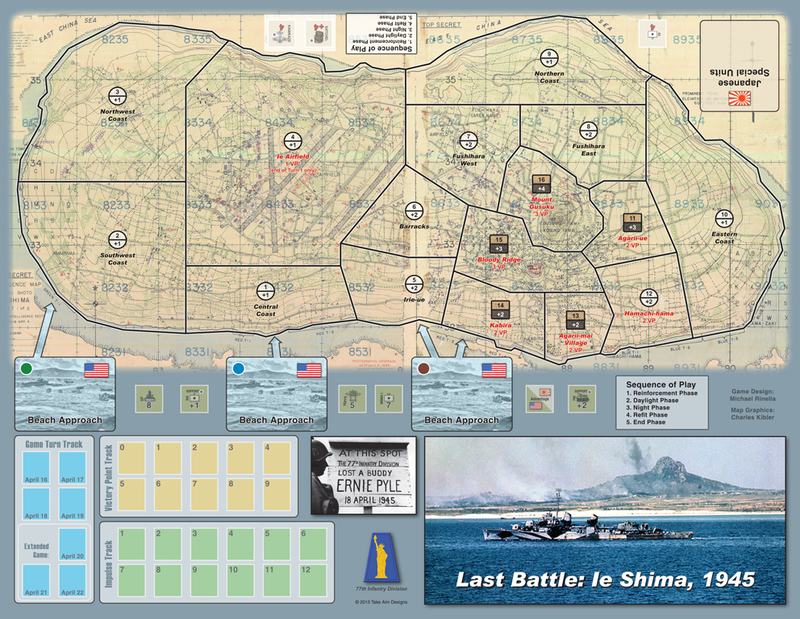 The situation is fluid and desperate for both sides, allowing for numerous strategies for both players. 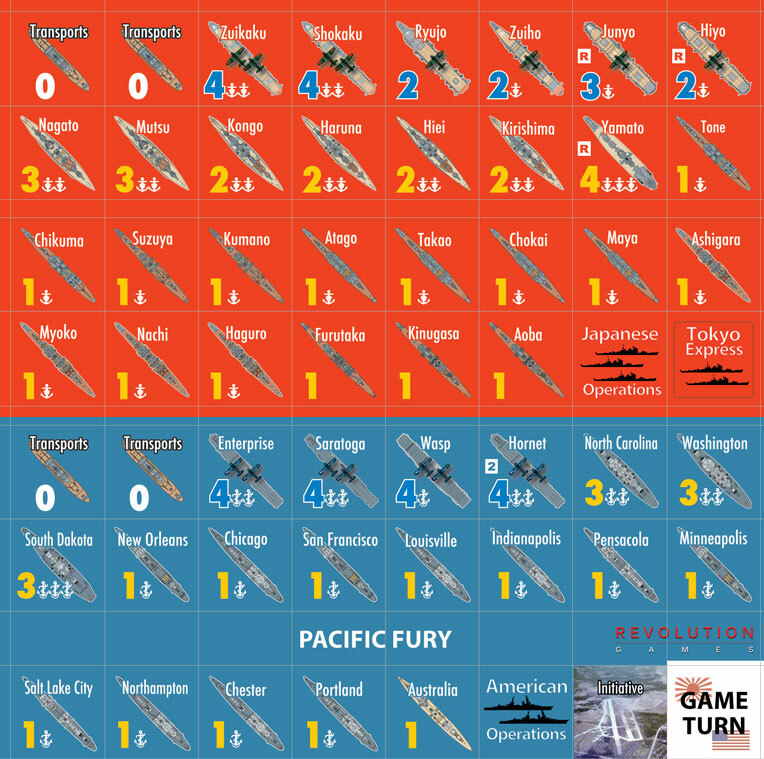 Victory is determined through both battle victories and occupation of key objectives to simulate the British effort to pacify and restore the loyalty of New Jersey. 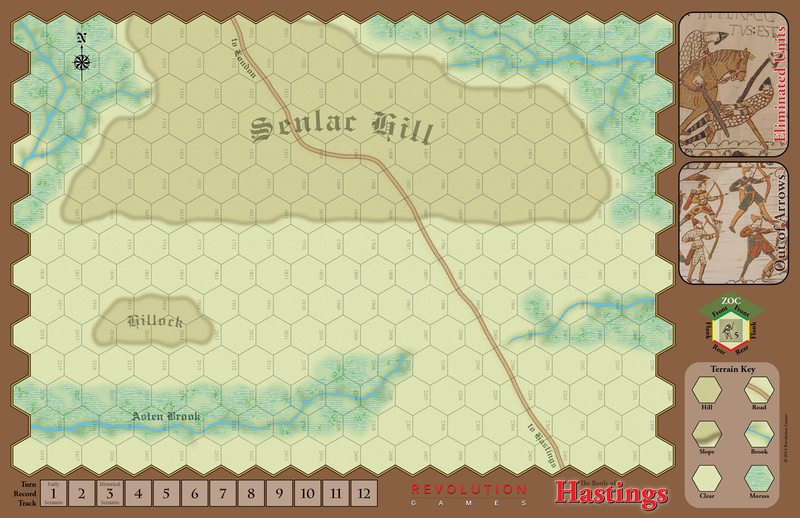 Washington’s Crossing is the first game in the Campaigns of the American Revolution series. 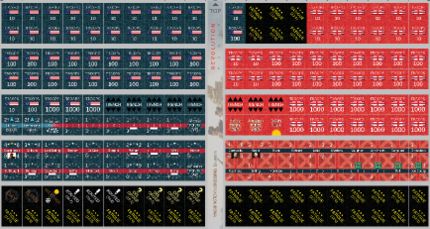 Future linkable titles in the series will cover the New York campaign of 1776, the Philadelphia campaign of 1777, and the New Jersey campaign of 1778. ©2018 Revolution Games, All Rights Reserved. 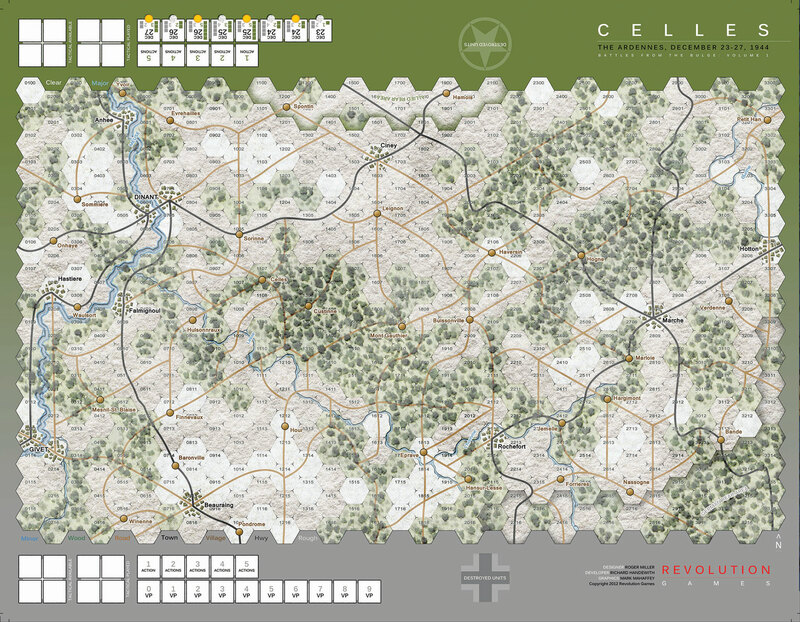 ​Celles is a fast moving simulation of the fighting at the high watermark of the German Ardennes offensive, AKA "The Battle of the Bulge". The Germans are advancing towards the Meuse River and are running out of fuel and time to force a desperate crossing to achieve Hitler's goal of ultimate "Victory". The Allied forces are both trying to block the German advance and begin a counter-offensive to destroy the German Panzer Divisions. 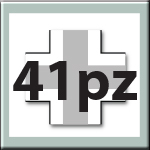 Boardgamegeek Post: This is a nice little game. The chit pull system works a little differently; instead of having the chits in one cup, each side has its own cup. So, each side will usually be able to do something during a turn. 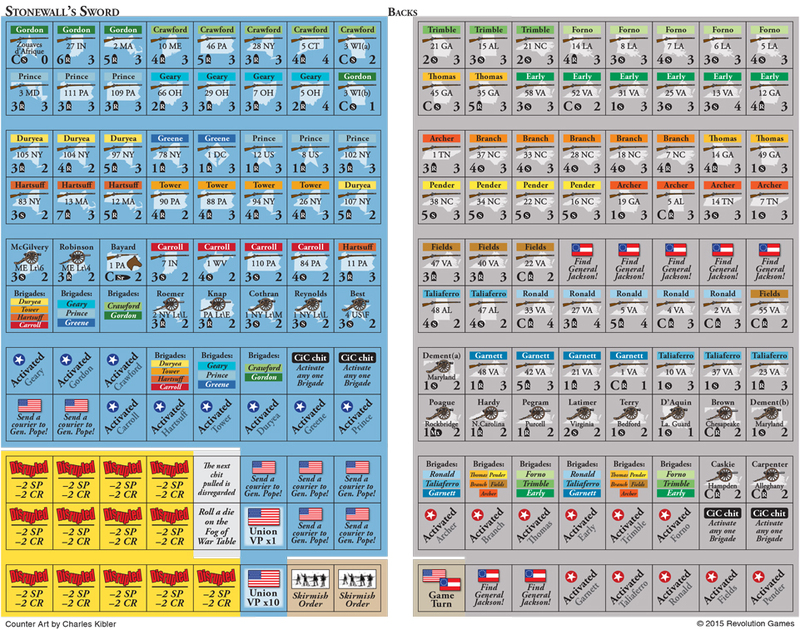 It is also asymmetric, the Germans have the advantage at night, and the Allies have the advantage in the day. 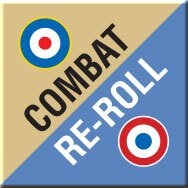 The combat and movement system are intertwined, it costs movement points to attack. So, the more movement points you can invest the more effective the attack and you have to plan a bit ahead to get full use out of your units and attacks tend to come in waves. Also, after a unit moves, it is flipped and becomes more vulnerable. 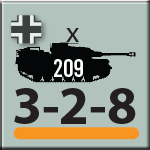 Another point I like about the game is that both sides will attack and defend during the game and the German player has several different choices to make in his overall strategy. 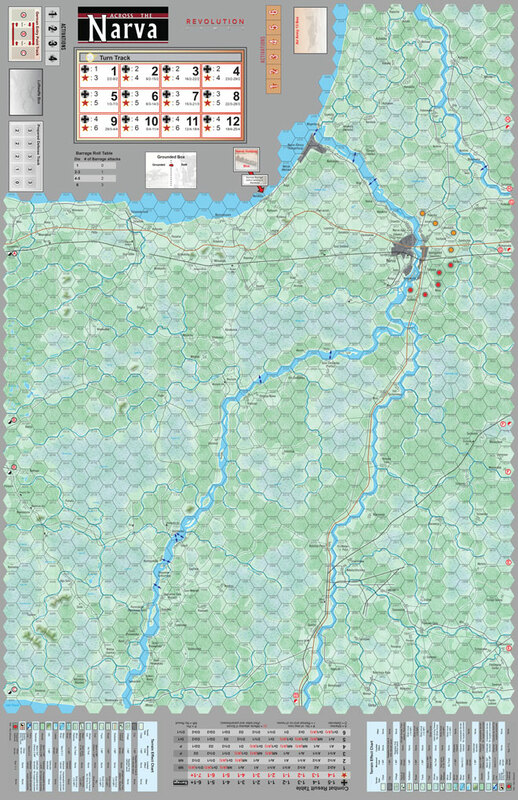 The two main ones being whether to dash to the Meuse with the 2nd Panzer or try to destroy the 84th infantry or some combination. 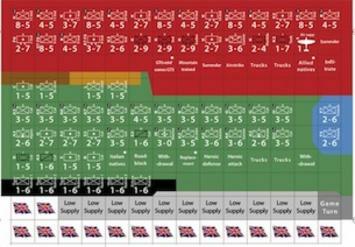 In any case, every game will be a little different given the chit draws. 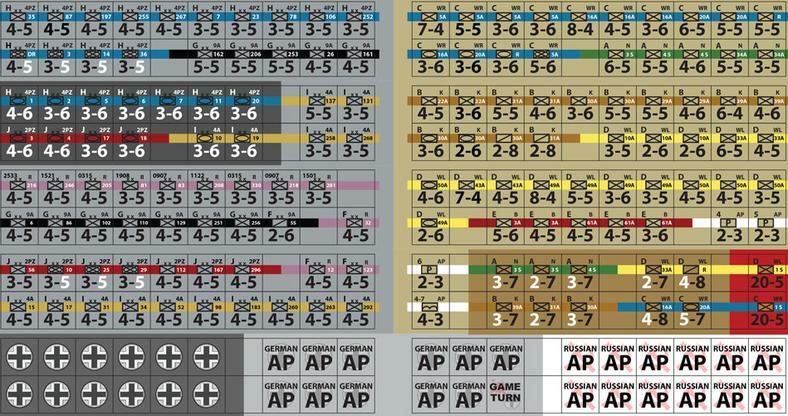 I forgot to mention that there are two types of chits, one for units which allow you to activate that particular unit or one counter from another unit and tactical chits which will give some benefit when played. This game will stay in my collection and I would probably try other games in the series. In my first game the Germans lost, when they got hung up trying to take Rochefort and then overextended themselves attempting to reach the Meuse. 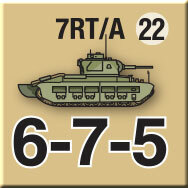 The counterattack by the 2nd Armored was devastating. Read the post here. 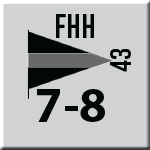 Checkout update on errata and common questions here. 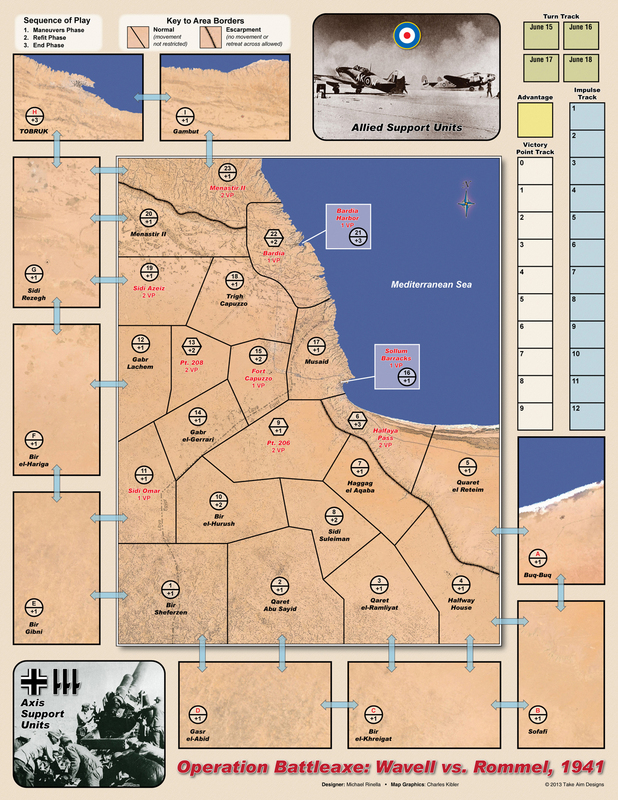 The road to Cheren is our new game covering the Eritrea campaign in East Africa in 1941. The campaign featured British and French forces versus the Italians in a wild and mountainous country. 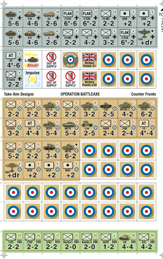 The game was designed by Kim Kanger who also designed Ici, c’est la France, Tonkin, and the soon to be released Dien Bien Phu, all by Legion Wargames. 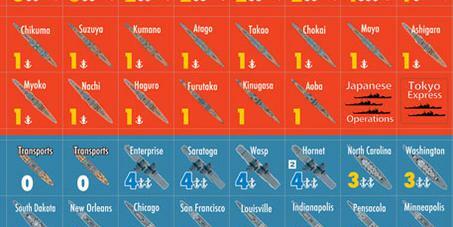 Cheren is a game where the movement of each piece is critical. 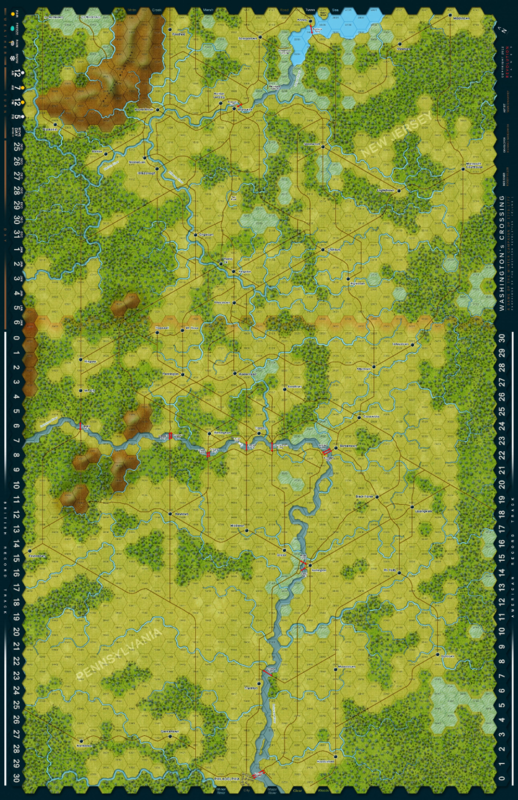 After movement your opponent may react but with only a few units, making player decisions difficult; do I go to the aid of a unit likely to be attacked or use my reaction to push troops forward in an area where I am on the offensive. After combat there is exploitation movement. 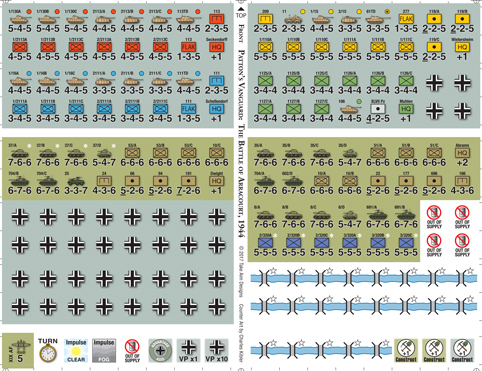 Only motorized infantry, tanks and cavalry may exploit and are scarce in this campaign. In addition there is a very nice chit pull system to give both sides some special abilities and keep the enemy guessing as to what comes next. Finally some Italian native units may decide to join the Allies, or they may stay loyal, which creates extra tension in the game. 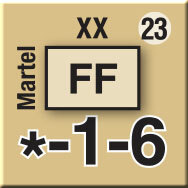 A gamers view of Cheren on BGG. 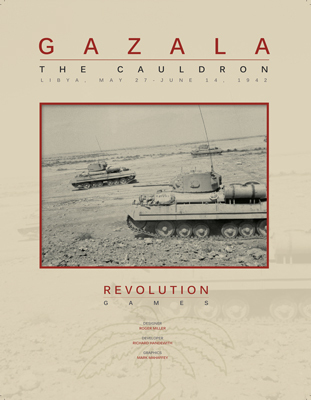 Gazala: The Cauldron simulates the mobile portions of the battle of Gazala south of Tobruk between May 27 and June 14 1942. 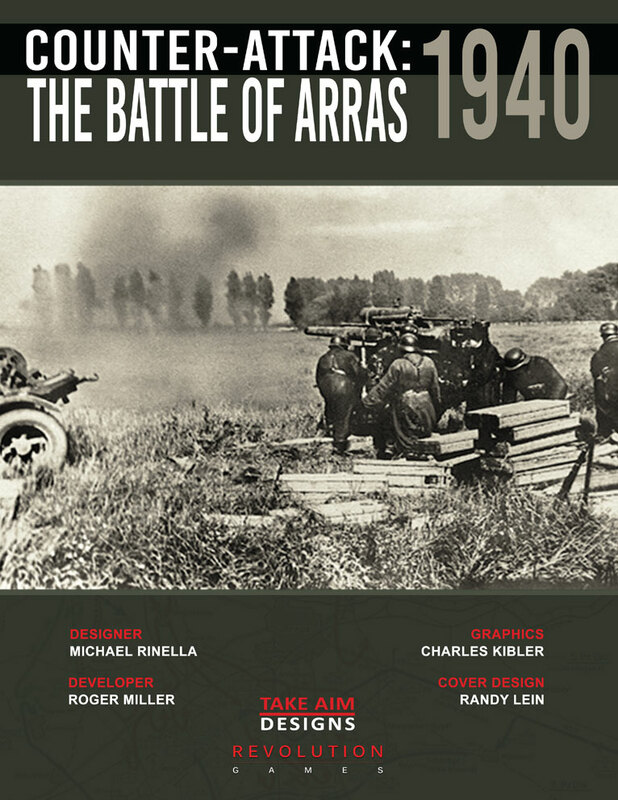 An Axis attack was met by a furious Allied counter-attack which then developed into a grinding battle of attrition and maneuver that finally ended in massive Axis victory. Alternating random activation by formation provides player with uncertainty and high re-playability as no two games will be alike. 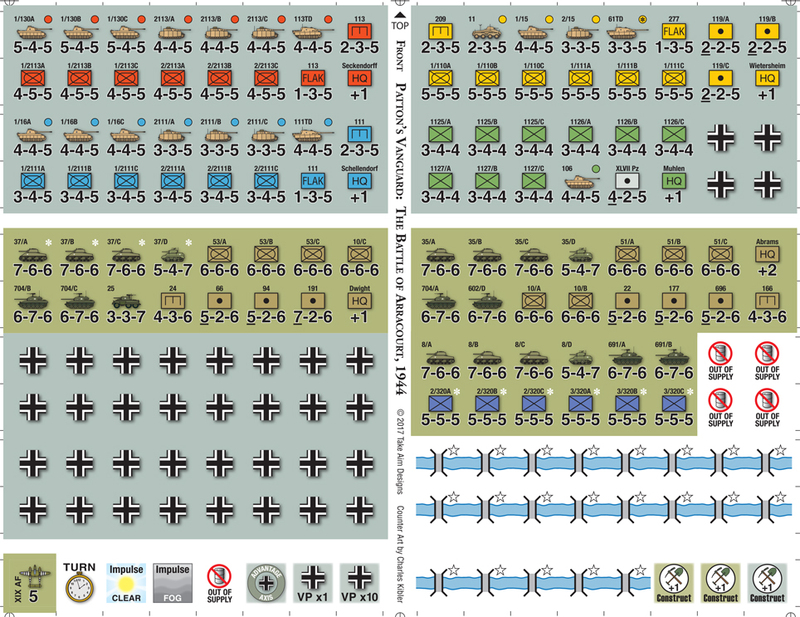 Each turn player receive a varying number of activations to represent the supply levels, command confusion, fatigue and intelligence of their armies and this leads to an ebb and flow to the battle as each side is dominant at different times. After units move, strengths are educed to simulate fatigue and lack of defensive preparation making counter-attacking key to the game. Minefields, airpower, anti-tank abilities and the armor versus infantry conflict are all modeled in a simple and effective set of rules. 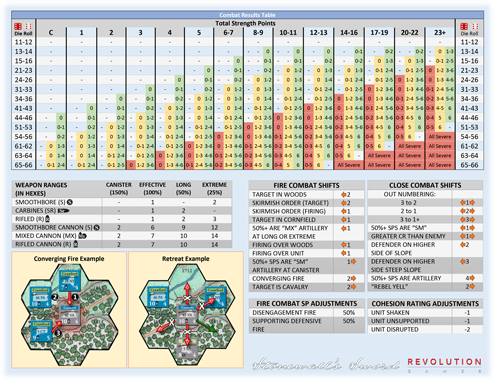 There are two scenarios with a playing time of 3-7 hours. Celles Rules now in French. Download here. 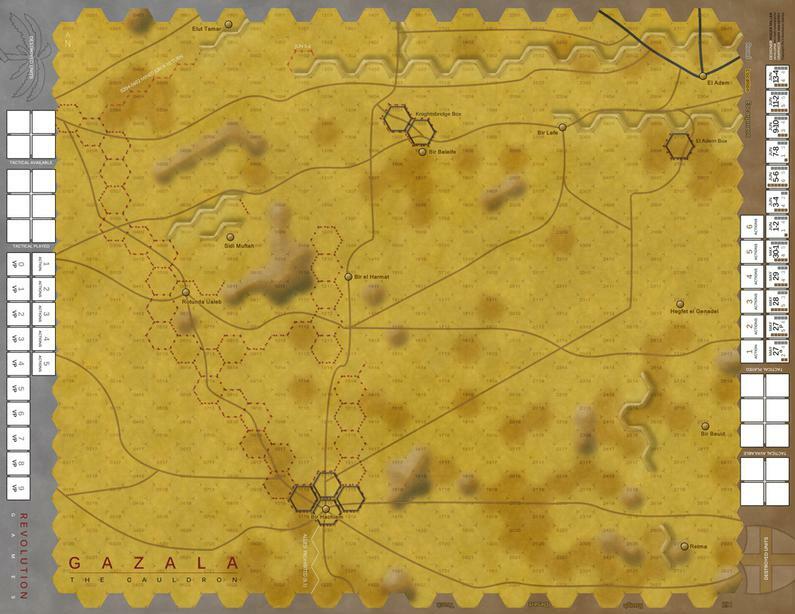 Operation Battleaxe is a quick-playing depiction of the June 1941 Allied offensive in the North African desert. 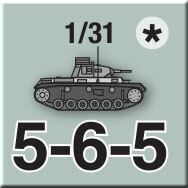 The Allies possess more tanks, including the “Queen of the Desert,” the Matilda, and have mastery of the air. Crossing the Egyptian border into Libya their mission is simple: destroy the Afrika Korps, and lift the siege of Tobruk! The Axis forces in the path of the Allied advance occupy well-prepared strongpoints, and lurking somewhere behind them are the German panzers – and Rommel, “The Desert Fox.” The next three days of battle will decide the course of the war in the desert for months to come. Utilizing a new and streamlined version of the “area-impulse” system players will experience the uncertainty of the desert battlefield. 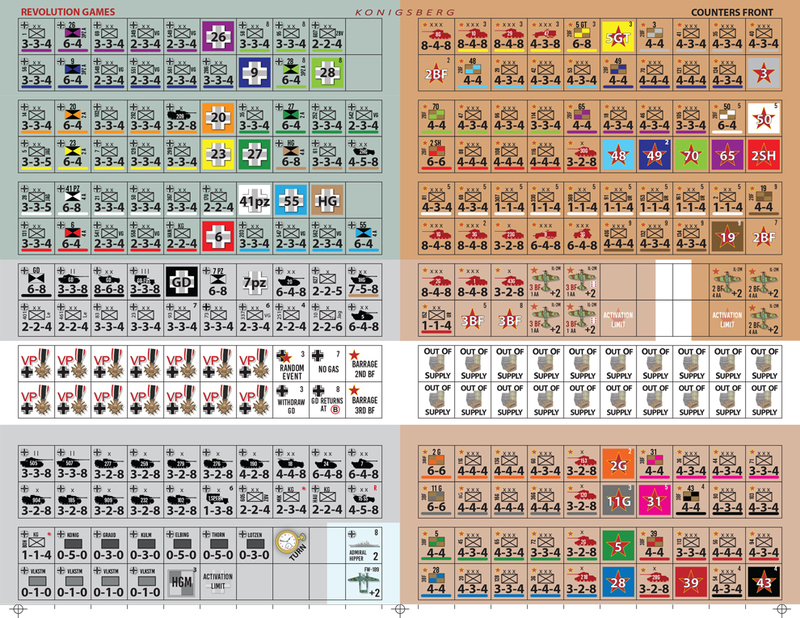 Each turn will contain a variable number of impulses, and both players will be challenged to determine whether it is better to attack first, or defend and then counter-attack. 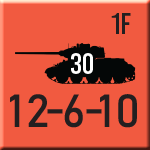 Having committed one’s infantry and armor to battle, artillery support may or may not be available. 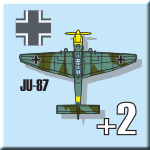 To win the Allied player must exploit his numerical edge in armor and artillery, plus airpower, to capture Axis positions and destroy German units. 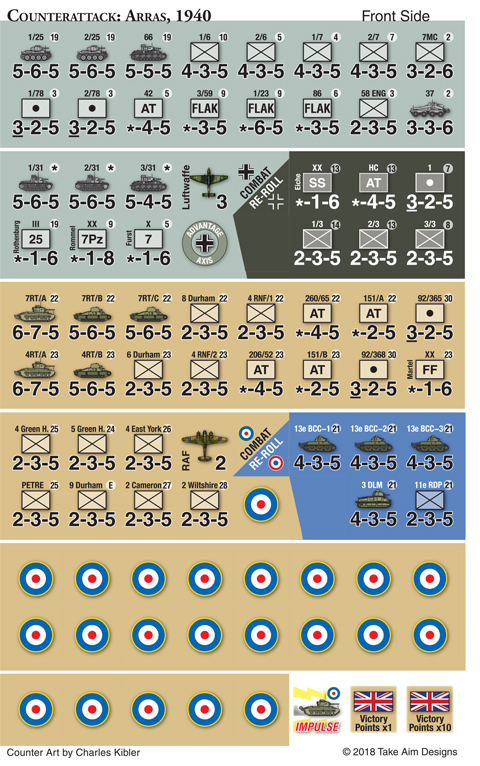 The Axis player must exploit his greater speed, operational flexibility and superior battlefield recovery, to recover lost ground and destroy Allied units. Fast, furious, and chess-like, this is a game for players who love concentrated action! New! 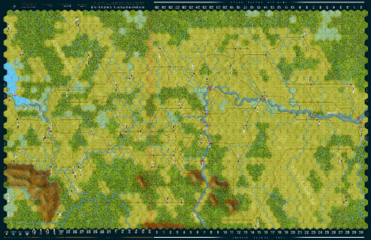 We have developed an advanced version of the game that introduces a modest increase in complexity while sacrificing none of the original's excitement! Download the advanced rules here. 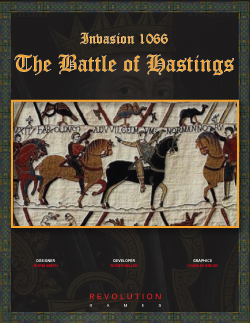 Invasion 1066: The Battle of Hastings is our exciting new game designed by Norm Smith. Originally published as Senlac Hill by Saxon Games, we have enhanced this great design by developing the rule set even further and providing new artwork by industry veteran Charles Kibler. Can you as William the Conqueror become King of England? Or will Harold deny the invader and keep his throne? 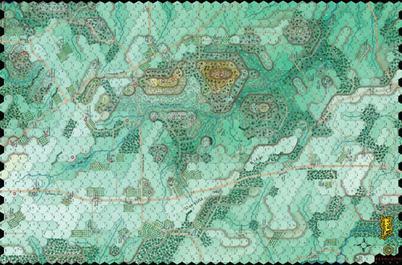 Map scale is 50 meters per hex and the units vary in size from 100 to 250 men. The game is quick-playing and bloody with easy to understand mechanics. 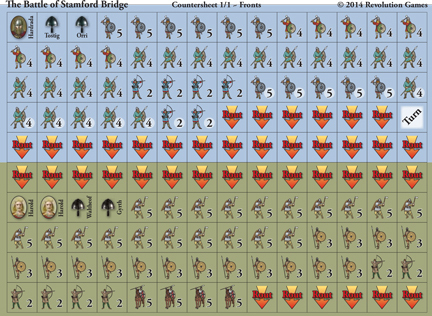 Historical touches such as cavalry charges, army morale by troop type, leader loss, arrow supply, Saxon javelins, the Papal banner; it is all here in a very easy to play package. ​Hastings - not just any old hill. There has long been speculation and debate as to exactly where the Battle of Hastings was fought. Errata now available. Get it here. 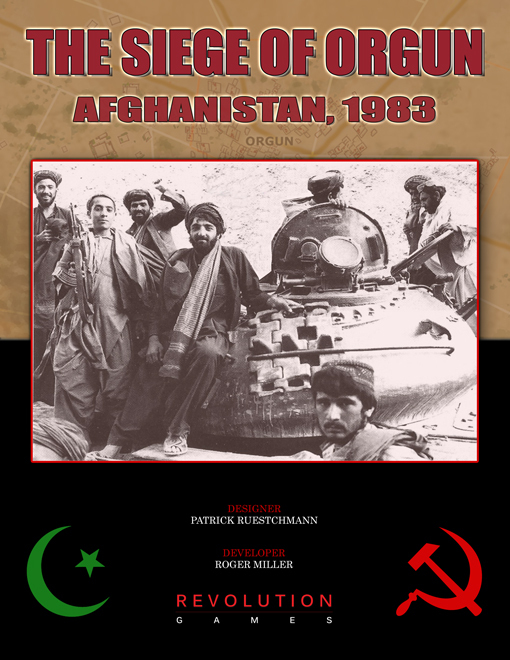 Orgun, Afghanistan 1983 - a strategic valley in the Paktika Province close to the Pakistan border. 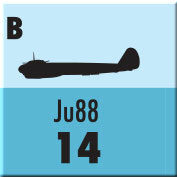 A large group of Mujahideen (800 strong) assaults fortified positions, including an airfield and a 19th century fortress, protected by a regiment of the Afghan Army reinforced by Soviet forces. 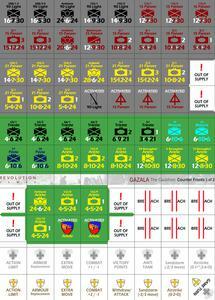 Area-Impulse system: fast and well-known combat resolution and activations. 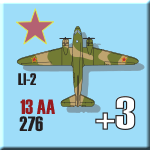 Interactive play with limited downtime between players. 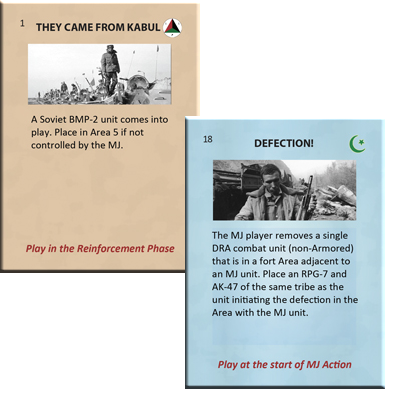 This is a card-assisted system for the element of surprises, helping to fit in the historical events into the game (soviet counselor, night assaults, radio jamming...). Low counter density. Minimal usage of markers. 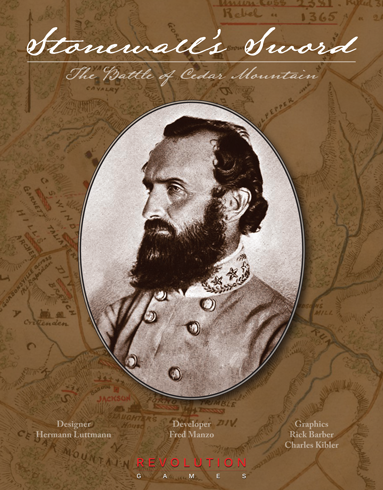 On the stifling hot morning of August 9th, 1862, Maj. Gen. Thomas “Stonewall” Jackson’s corps of Confederate veterans encountered a lone Union division under the shadow of Slaughter’s Mountain (also known as Cedar Mountain). 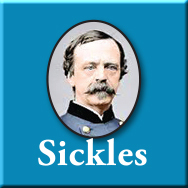 The isolated Union division belonged to Maj. Gen. Nathaniel Banks, Jackson’s rival during the Valley Campaign and an opponent who the great Stonewall had consistently defeated. The Confederate troops were some of the best in the Rebel army, they outnumbered the Union force and were under the command of one of the iconic generals of American history. What could possibly go wrong? Stonewall’s Sword: The Battle of Cedar Mountain is a medium-sized wargame (176 counters and a 17” x 22” map) that allows you to explore the reasons why things almost went horribly wrong for the Confederates that day. 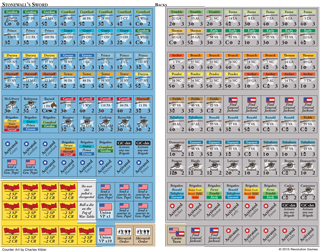 The map scale is 140 yards/hex and each unit counter represents an infantry regiment or artillery battery. 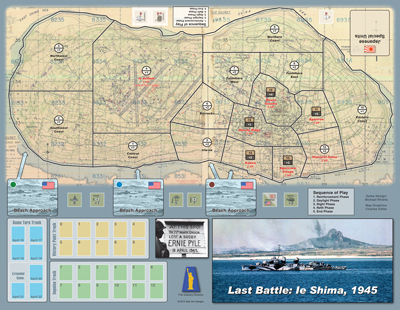 The game system features the Blind Swords chit-pull mechanic, which thrusts players directly into the fog-of-war of an American Civil War battlefield. 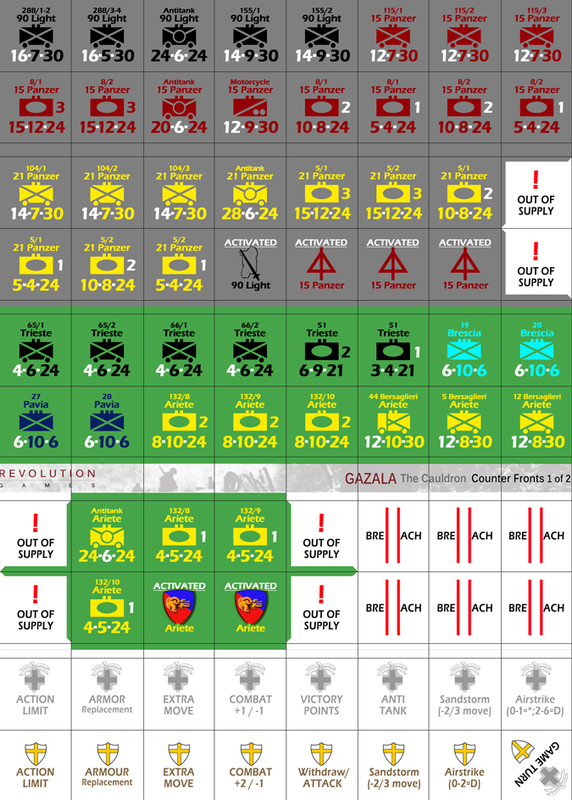 Players are never quite sure of when formations will activate – neither the enemy’s units nor their own! Event chits, each tailored to the conditions that existed at the battle, provide players with opportunities to create out-of-sequence attacks, rallies and a myriad of other actions. Players are thus constantly challenged with each chit-pull to produce a plan of action that will best exploit the current circumstances on the field. 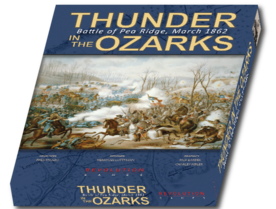 This unpredictable player interaction creates not only an exciting gaming environment but also accurately simulates the confusion, intensity and unusual circumstances of the Cedar Mountain battlefield. 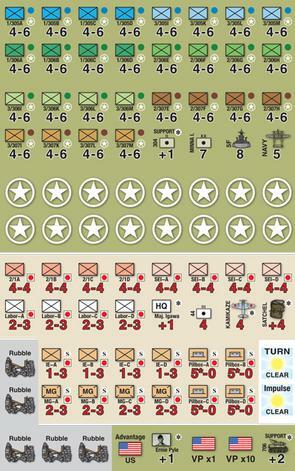 The game system also features a simple Brigade Orders mechanic that forces players to assign activated brigades one of four orders – Attack, Defend, Maneuver or Regroup. 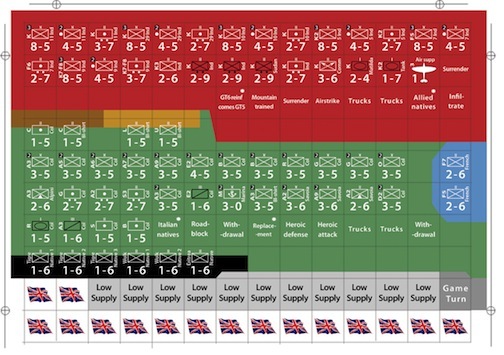 The assigned order sets the parameters for the activated units and dictates how they can move, what type of combat (if any) they can perform and if they can rally. 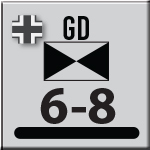 This establishes the “tone” for the units in the upcoming turn and reflects the effects of command orders without the need for complex rules or order writing. In addition, certain “what-if” options have been included, allowing the Union player to possibly get Ricketts’ Division to arrive sooner than it did historically or the Confederate player to have Jackson snap out of his “stupor” earlier in the day. 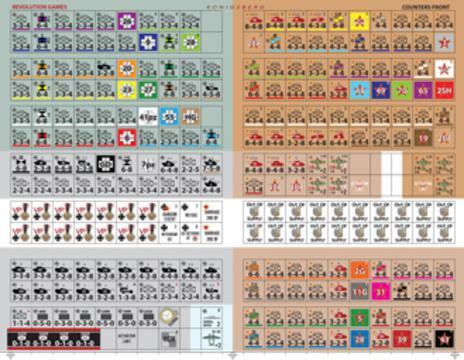 Both of these possibilities can be influenced by the players through the allocation of their Command Event chits. 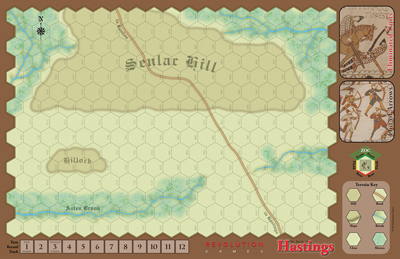 Stonewall’s Sword attempts to be a unique gaming experience – one that elicits a fun gaming experience in unison with a realistic representation of the Battle of Cedar Mountain. We hope you agree. Celles Rules now in Spanish. Download here. Celles Rules now in English. Download here. 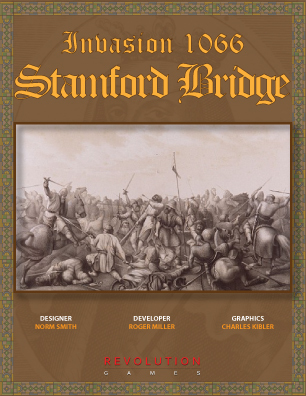 Invasion 1066: Stamford Bridge is the second game in the Invasion 1066 series designed by Norm Smith. Originally published as Orri's Storm by Saxon Games, we have enhanced this great design by developing the rule set even further and providing new artwork by industry veteran Charles Kibler. Just days after defeating an English army at Gate Fulford, Harald Hardrada, the Viking warrior king is caught by surprise at Stamford Bridge by a second English army. 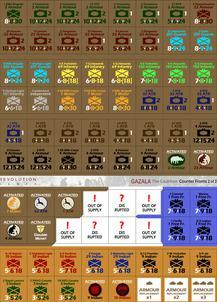 Map scale is 50 meters per hex and the units vary in size from 100 to 250 men. The game is quick-playing and bloody with easy to understand mechanics. Historical touches such as berserker rage, Orri's storm, viking shield wall, army morale by troop type, leader loss, and arrow supply; it is all here in a very easy to play package. Originally published in Japanese by Bonsai Games, Revolution Games brings Pacific Fury to the English speaking world. 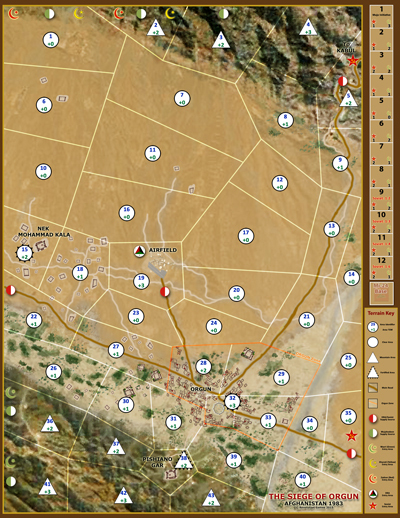 The game system features an abstract semi-hidden area movement system where both players must determine the timing and size of task forces during an operation. 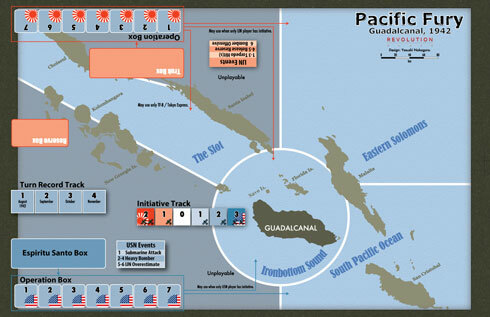 The American player starts with control of Guadalcanal, the Japanese must take it to win! 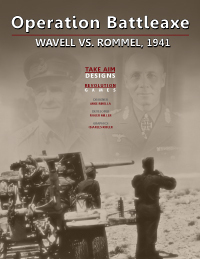 Read the designer's AAR here. In the winter of 1861, the Confederate army in Missouri, then commanded by Major General Sterling Price, had been chased back into the Boston Mountains of Arkansas. 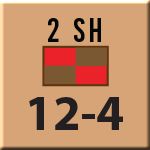 The first drive on St. Louis had been repulsed and Van Dorn was summoned to take command of the force and launch a new offensive into the heart of Missouri. Van Dorn, an Indian-fighting cavalryman by trade, arrived at the Rebel camp and even though he was quite ill (due to a fall into a river) he immediately roused the troops. 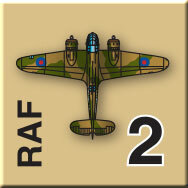 He proposed to launch an immediate attack, despite the freezing weather and fatigued state of his troops. 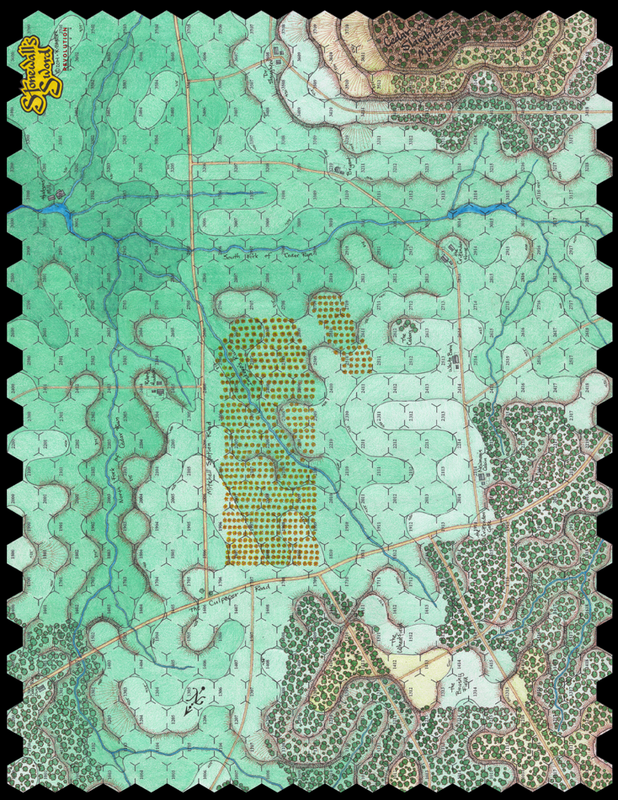 Van Dorn force-marched the army north and managed to pull off a classic Napoleonic stratagem - the “maneuver sur la derrieres”. He placed his army astride the line of communications of his enemy and by any normal military measure this should have been settled the issue for the two armies. But by doing so at such an ill-advised time and at such an inhuman pace the Rebel troops were little more than a frozen and exhausted armed mob when they finally reached their positions. Brig. General Sam Curtis was not a man to be intimidated and he realized that he had a fighting chance, even in this seemingly impossible position. 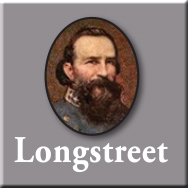 Perseverance and hard, smart fighting by men like Colonel Grenville Dodge and others turned what looked to be a potential disaster into a grand victory. 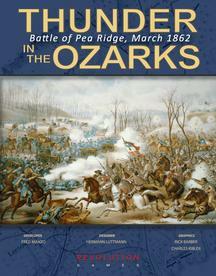 The Battle of Pea Ridge secured for the Union all of Missouri and the northern part of Arkansas, resulting in approximately 85,000 square miles becoming Federal-controlled territory. 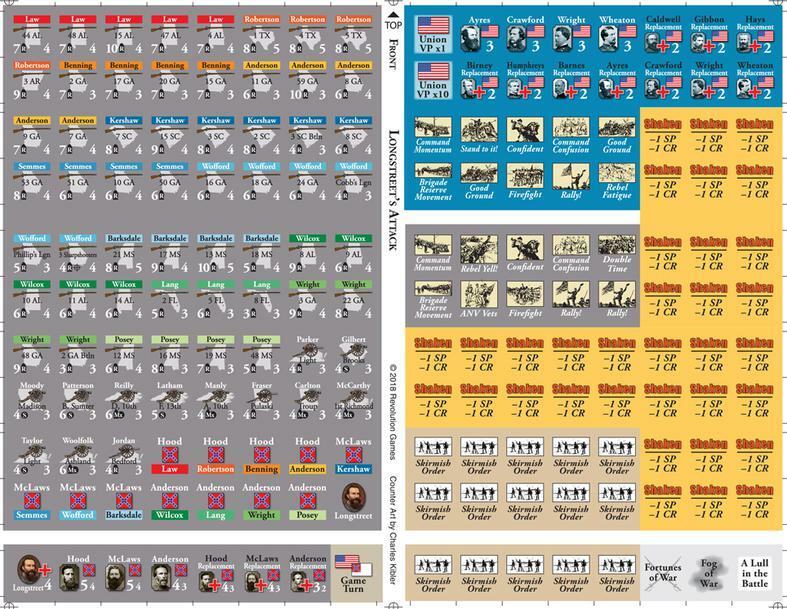 This is the second game in the Revolution Games series of American Civil War games. 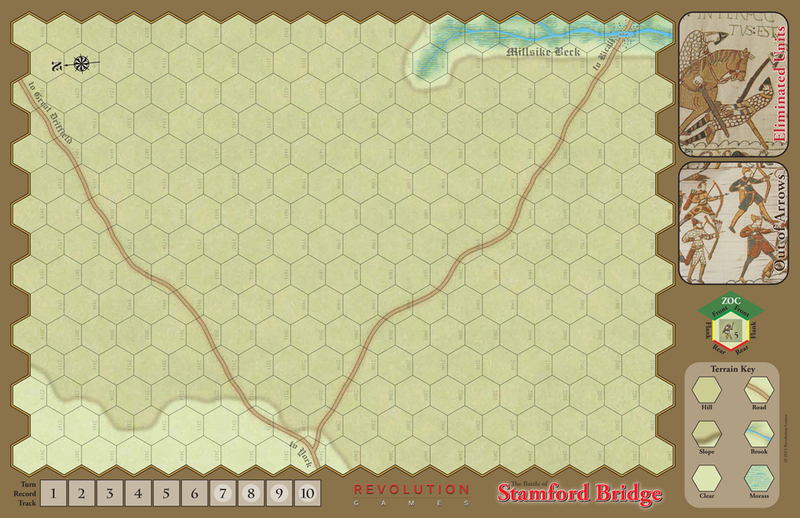 The first game, Stonewall’s Sword simulates the battle of Cedar Mountain in 1862 and is available from Revolution Games. 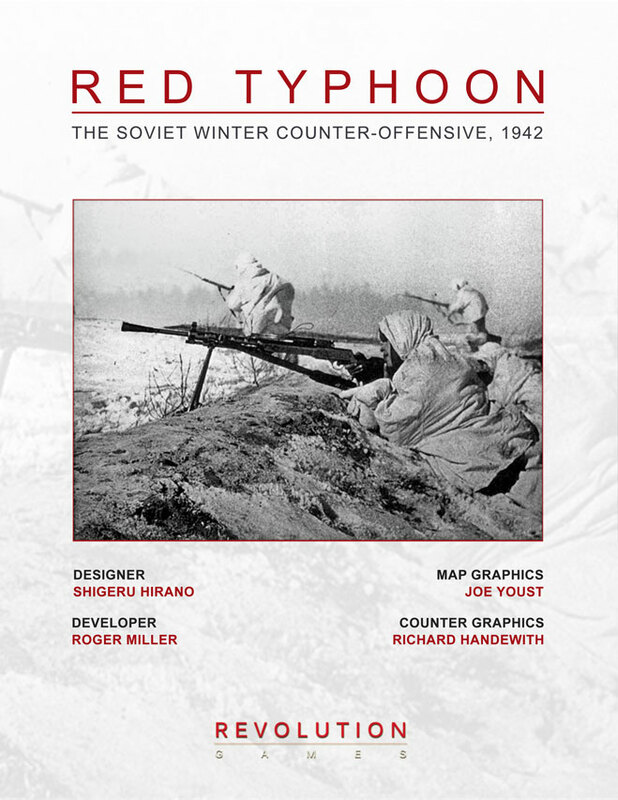 RED TYPHOON is a redesign by Revolution Games of the fourth game of the popular PANZER KORPS series; originally published by Command Magazine Japan. Red Typhoon simulates the early 1942 Russian counter-offensive in front of Moscow that almost destroyed Army Group Center. 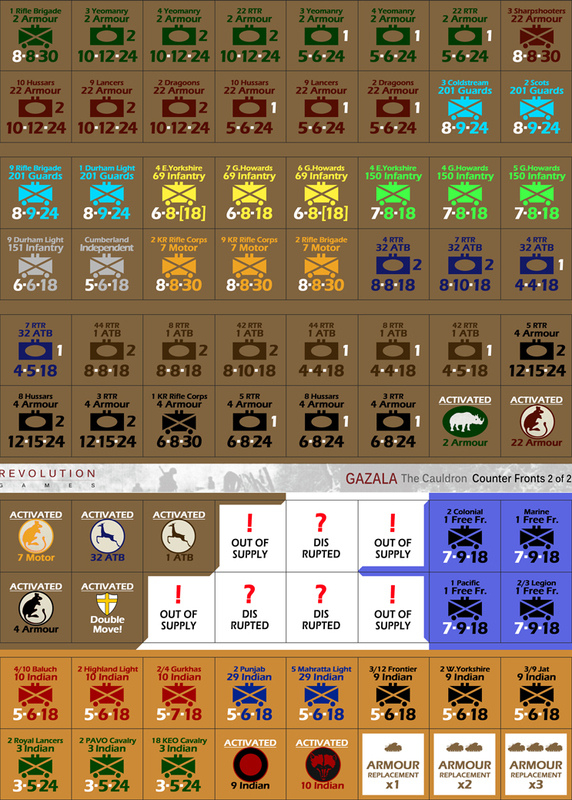 Can you as the Soviet player complete the destruction or can you as the German player survive the Soviet onslaught. 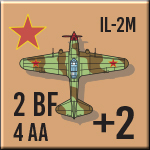 RED TYPHOON is a two player game following an IGO-UGO turn sequence with activation points controlling the movement and attack of each of your formations. 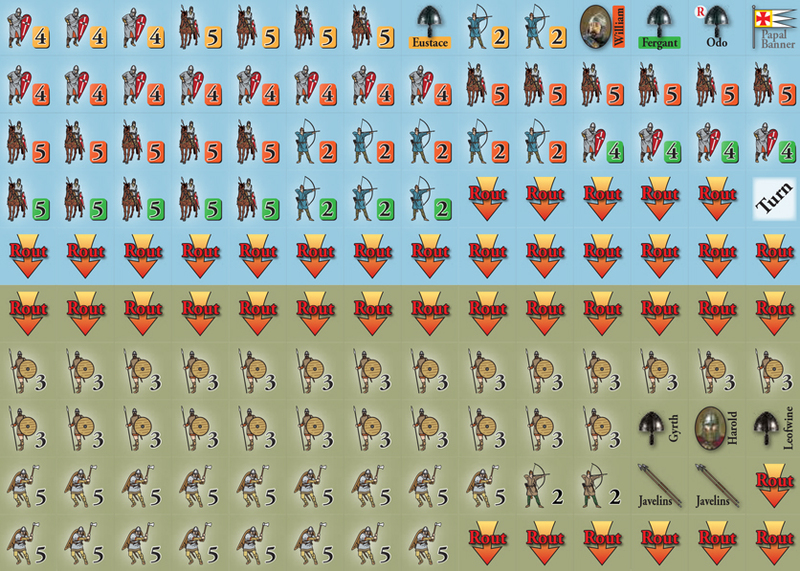 This means that some units will not move or attack, some will just move or just attack and some will both move and attack. The players choices of how to use his activations is the most important decision in the game. 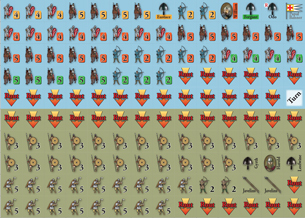 Combat is fairly traditional with the additions that units are retreated by the attacking player and that retreated units are disrupted. Players able to take advantage of these two factors will be successful. 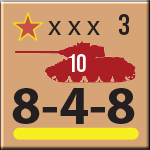 The game starts with several large Soviet breakthroughs that the German player must skillfully plug and in certain situations counterattack. 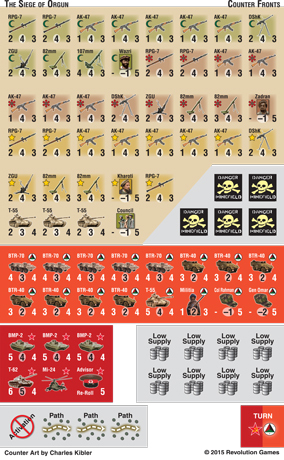 There are special rules for German panzers, Soviet Airborne and Partisans. 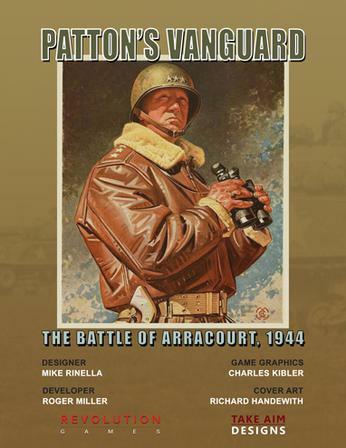 As the summer of 1944 drew to a close and Combat Command A of the American 4th Armored Division passed through the French town of Arracourt the war seemed all but over. It seemed as if nothing could stop the Americans from forcing their way across the German border and reaching the Rhine River. 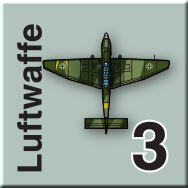 The weather, however, was rapidly deteriorating and Allied air reconnaissance failed to detect a counteroffensive by the German 5th Panzer Army. 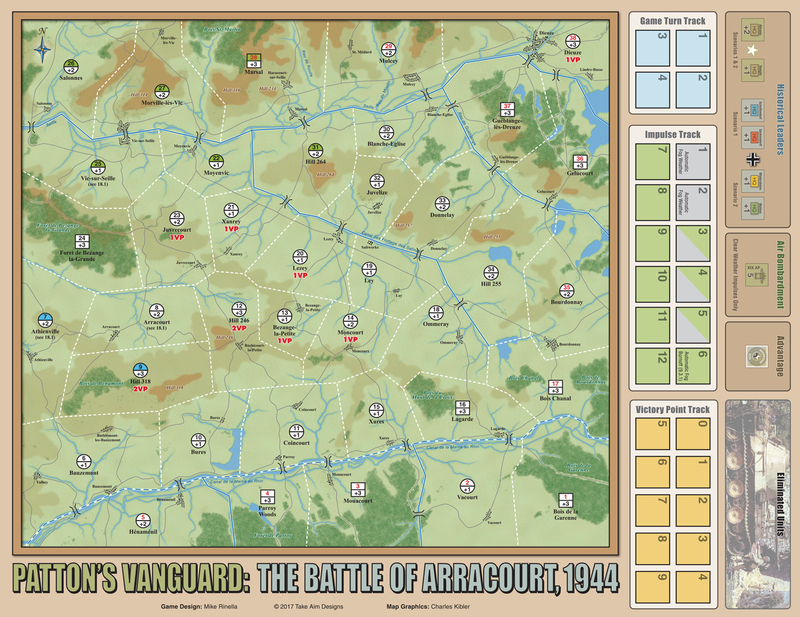 The stage was set for the largest clash of armor on the western front until the Battle of the Bulge. 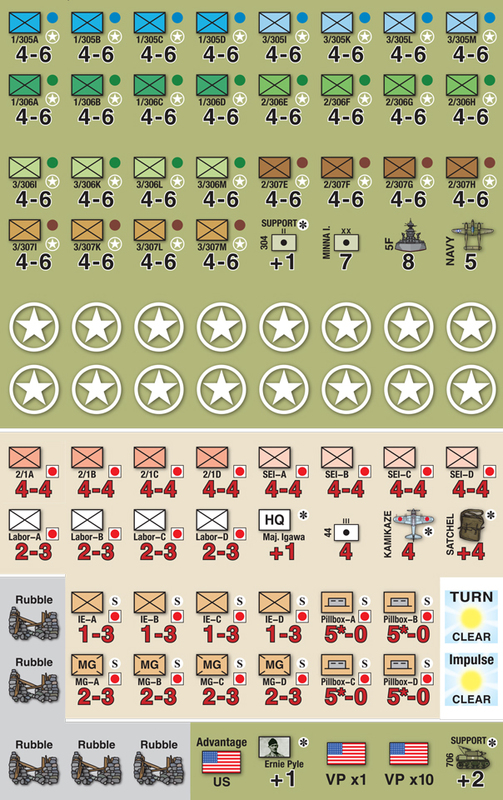 Patton’s Vanguard consists of two quick-playing four turn scenarios depicting the German attempt to drive the Americans from the German border. 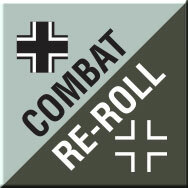 The first scenario pits two inexperienced German panzer brigades against a confident and veteran Combat Command A. 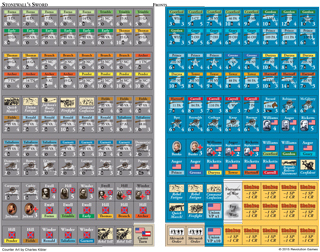 The German side has more armor, including the superior Panther tank, and the poor weather generally favors them, but the American side has more artillery as well as better tactics and leadership. 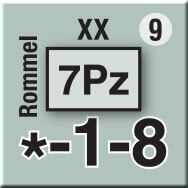 The second scenario pits the experienced German 11th Panzer Division against Combat Command A and the newly arrived Combat Command B, now hampered by restricted fuel supplies. 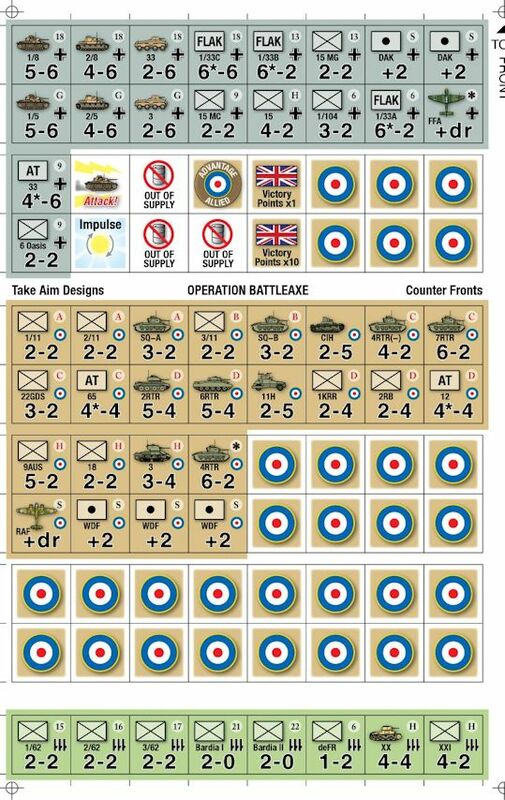 In each scenario both players will be challenged to determine whether it is better to simply attack, or spend valuable time attempting to maneuver in continually changing weather conditions before attacking. Fast, furious, and chess-like, this is a game for players who love concentrated action! 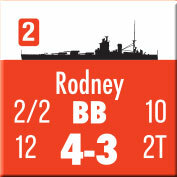 Königsberg, originally produced in limited quantities by 3 Crown Games. 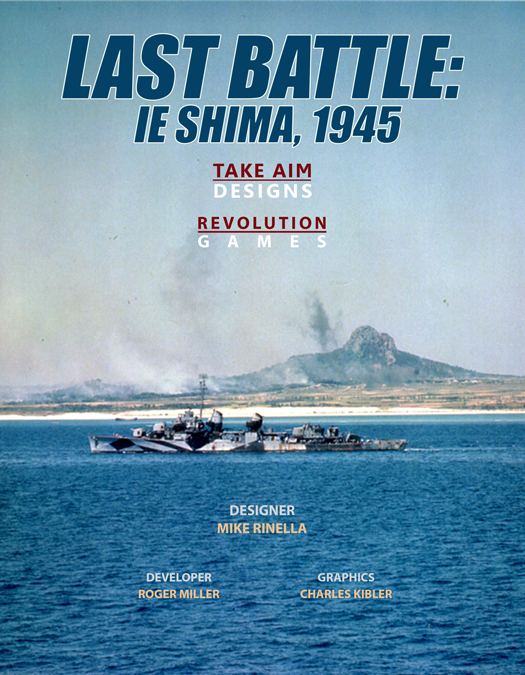 Revolution Games will be updating this fine game with new art, testing, and development. 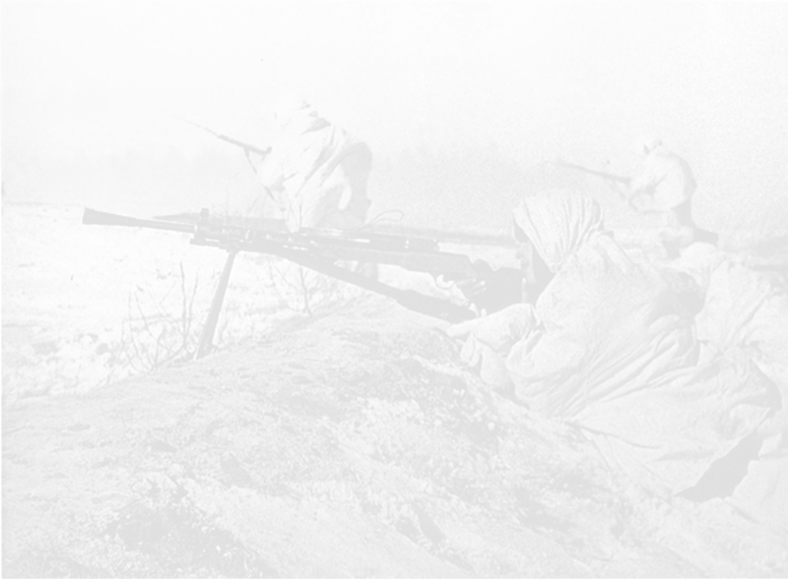 Covering the Soviet attack in East Prussia in 1945. 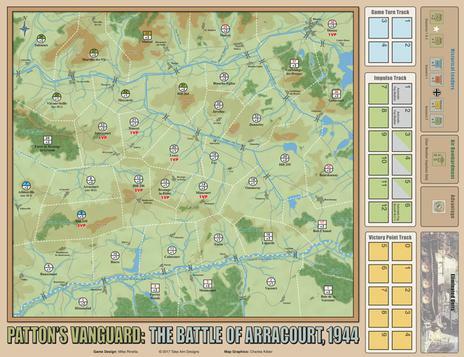 The game handles the 20 first days of the attack starting on the 13th of January 1945. The 3rd Belorussian Front under command of Cherniakhovsky launches an attack into the northeast of East Prussia while the 2nd Belorussian Front, commanded by Rokossovsky, one day later starts an attack from the south east. 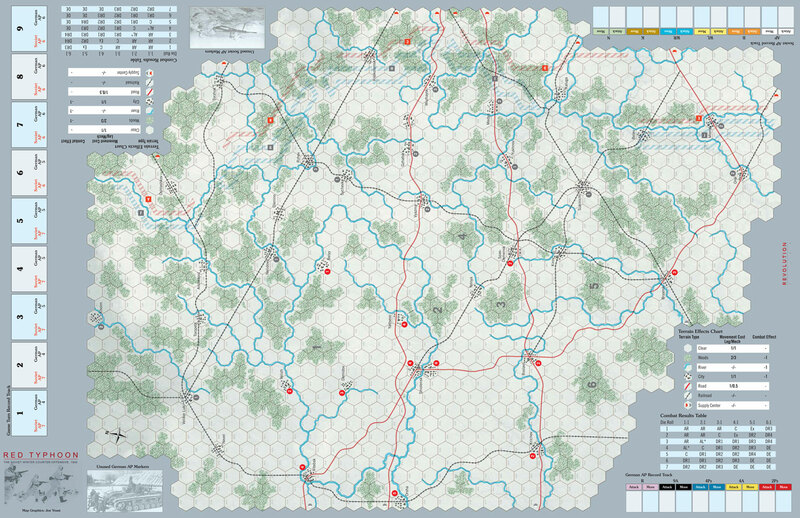 However, Army Group Mitte, under the command of Reinhardt, puts up an astonishing defence desperately pushing the Soviets back. 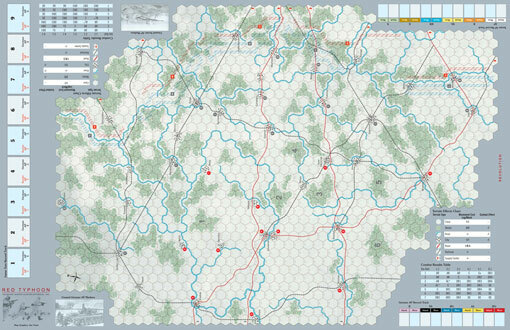 The time is however on the Soviet side and when the defence finally crumbles there is nothing left to withstand the Soviet troops to ravage the country. 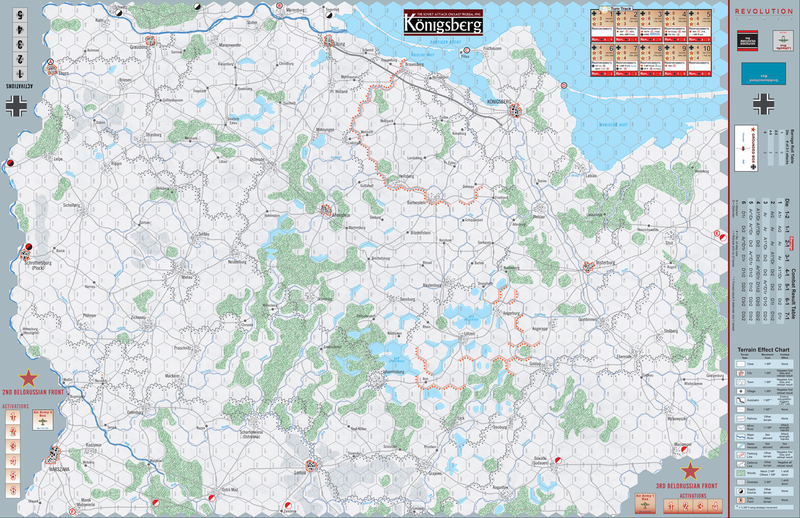 Königsberg is easy to learn yet a challenge even for the more experienced players. 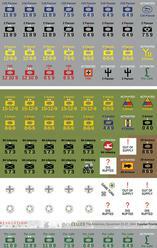 It is built around the same system of rules that have shaped both Plan West, and Army Group Narwa. 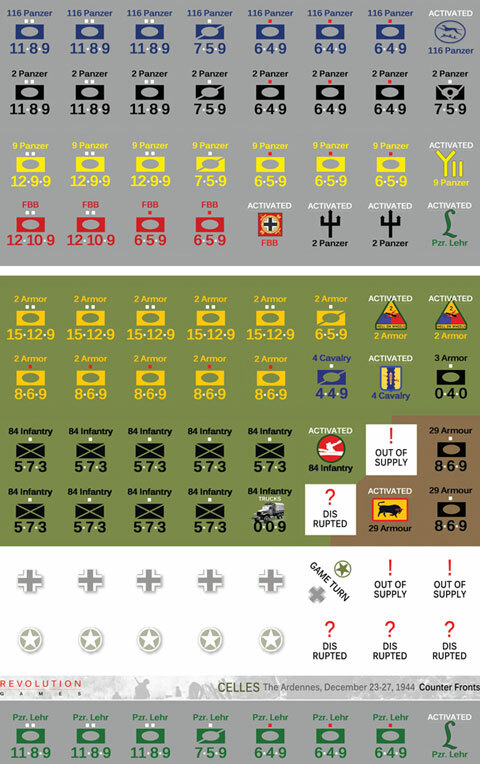 The game uses a chit pull system telling you which armies to move. 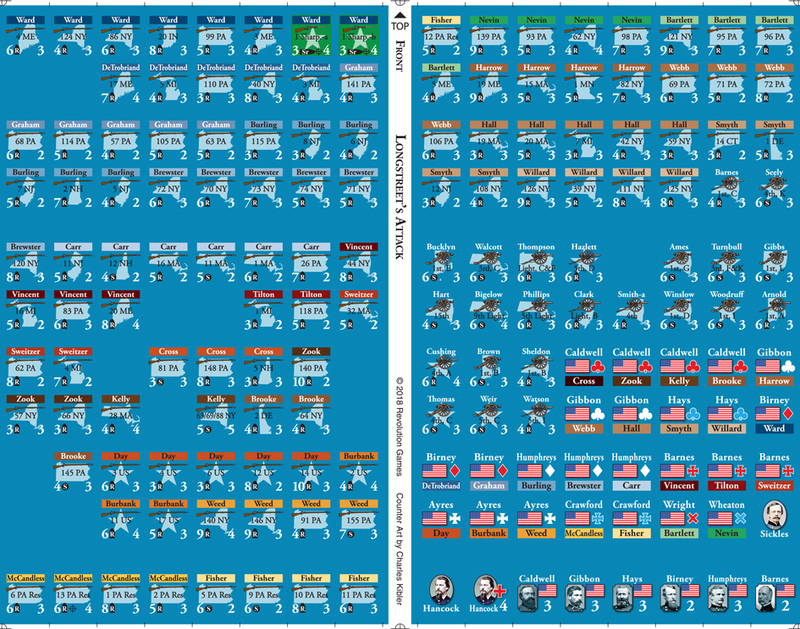 Each turn is two days and the game has 10 turns. 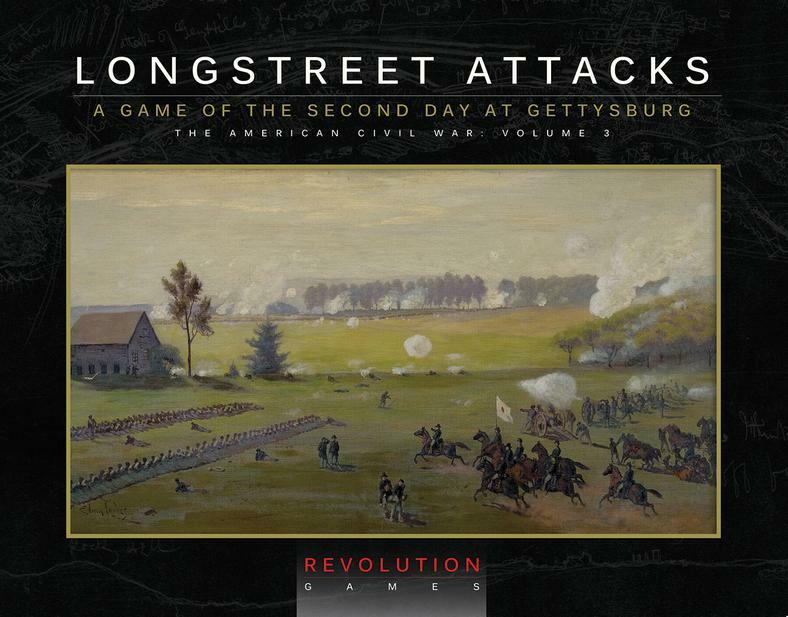 Longstreet Attacks: The Second Day at Gettysburg is the third game in the Revolution Games series of American Civil War games. The first being Stonewall's Sword and the second being Thunder in the Ozarks. 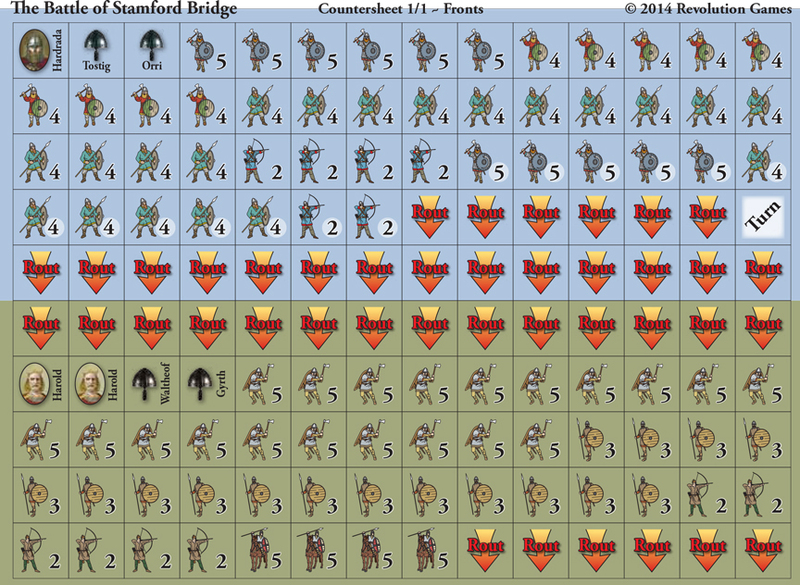 The Round Tops (Tutorial) – a small, limited battle depicting the fighting around the Round Tops and which serves to teach the system to new players. 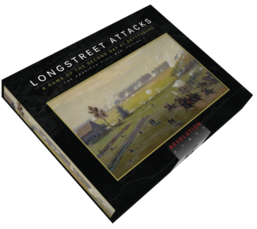 Hammerin' Sickles (Historical) – the entire attack by Longstreet beginning at about 4:00 pm, using the historical deployment locations. 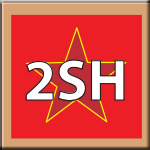 Revolution Games is proud to sell Quarterdeck International games. You can purchase these games from our online store in addition to purchasing Revolution Games titles. 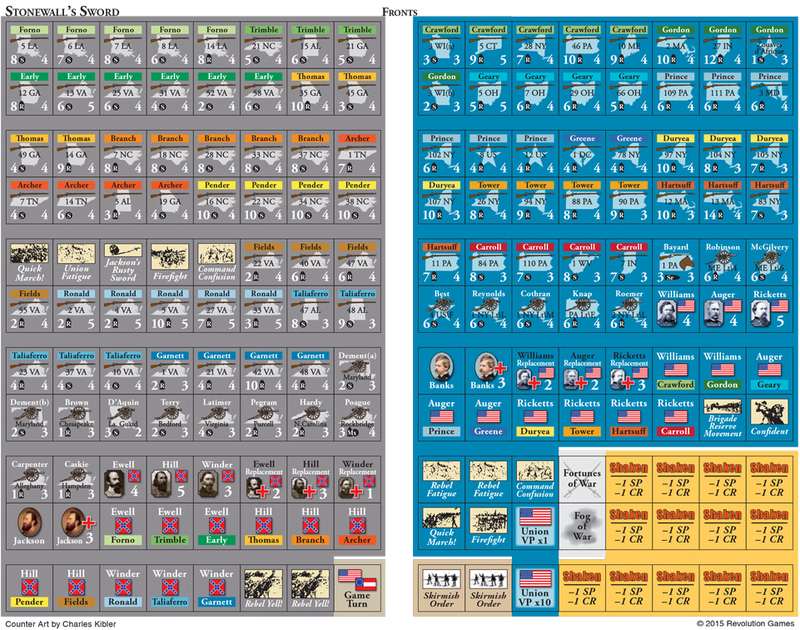 **Revolution Games coupons do not apply to these games. 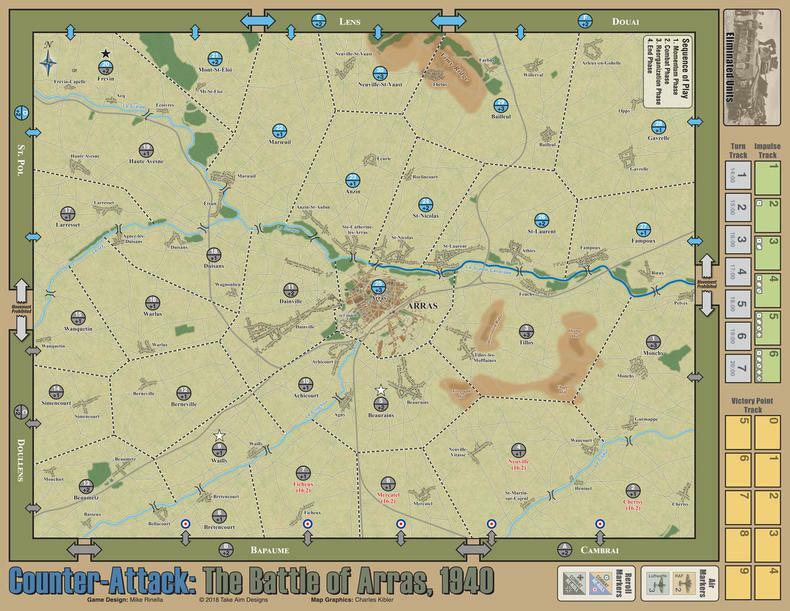 02-09-2019 Counter-Attack: The Battle for Arras,1940 is now Shipping. 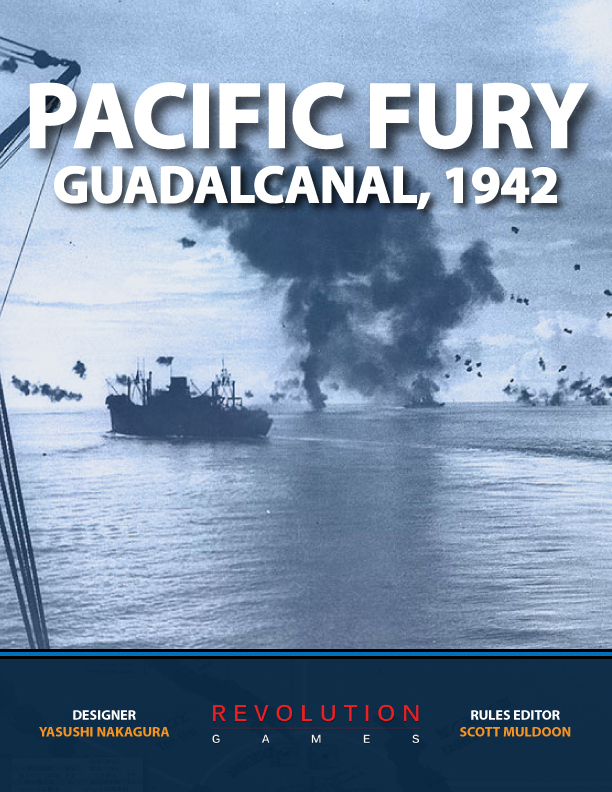 "A critical moment came just as my forces reached the Channel. 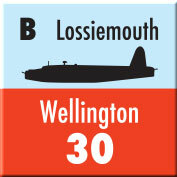 It was caused by a British counter-stroke southwards from Arras on 21 May. 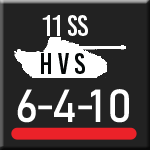 For a short time it was feared the panzer divisions would be cut off before the infantry divisions could come up to support them. None of the french counter-attacks carried the threat of this one." 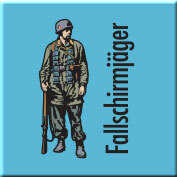 - Von Rundstedt, Commander German Army Group "A". 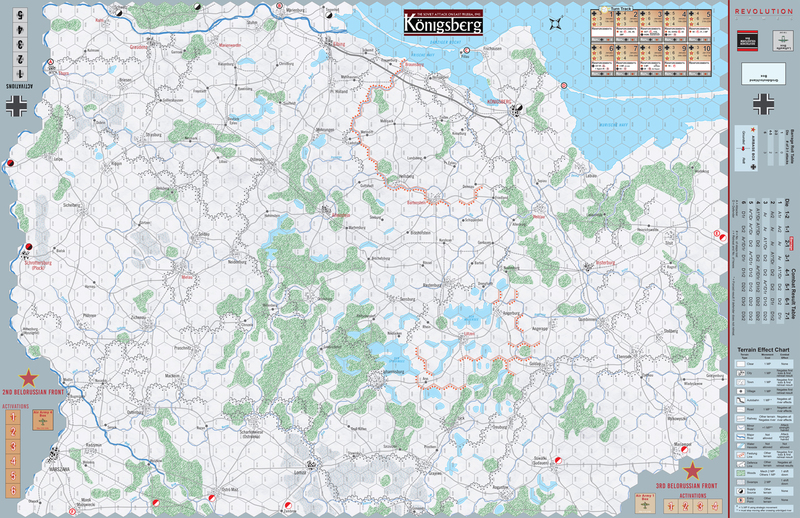 12-16-2018 Across the Narva is now shipping! !